It’s no secret that I’m a little obsessed with Thanksgivukkah. Since I love food and parties (who doesn’t?! ), I’ve already decided that this once-in-a-lifetime holiday must have the menu to match. Over the next few weeks, I’ll be sharing some of my original Thanksgivukkah recipes on The Big Fat Jewish Wedding. Be sure to check back later for more delicious ideas to round out your holiday table! 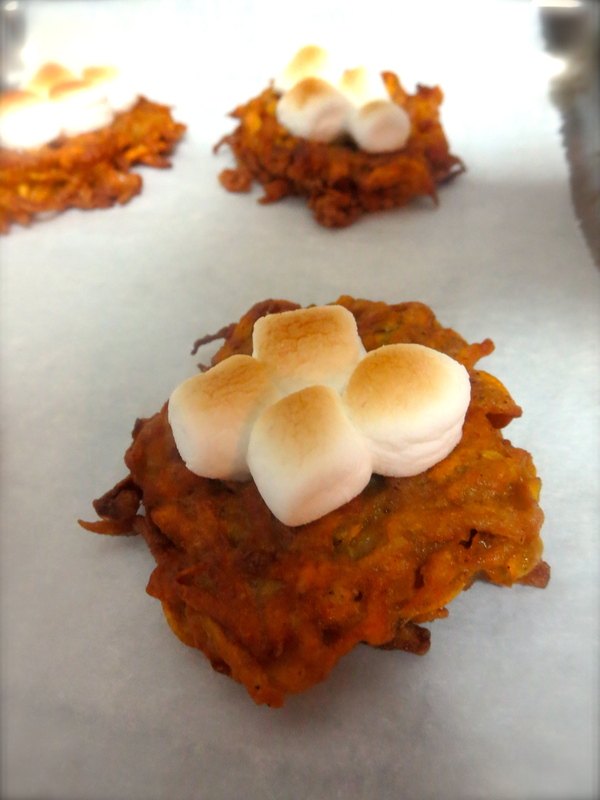 When I was brainstorming my Thanksgivukkah menu, I couldn’t help but think about one of my favorite childhood holiday dishes- Sweet Potato Yum Yum! What my family calls Sweet Potato Yum Yum, your family might call sweet potato casserole. You know, that heavenly concoction of pureed sweet potatoes, margarine, brown sugar and spices, topped with marshmallows and baked to perfection. Mmmm. What better way to combine the two holidays then to make these totally yummy Sweet Potato Latkes with Toasted Marshmallows?! 1. Peel and coarsely grate the sweet potatoes. 2. Place grated potatoes in a dish towel and wring out as much excess liquid as possible. This step is key to making sure your latkes are crispy! 3. Begin heating oil in a deep 12-inch skillet over moderately high heat. 4. 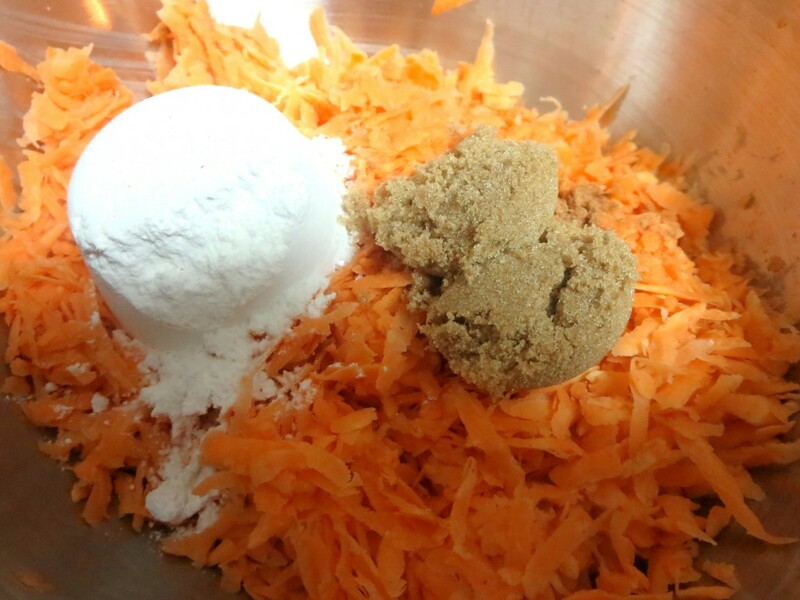 In a medium sized bowl, stir together potatoes, flour, salt, pumpkin pie spice and brown sugar. 5. Lightly beat eggs in a small bowl. Fold eggs into potato mixture until combined. 6. Check to see if oil is hot enough by putting a small drop of the potato mixture in the oil. If it starts bubbling, it’s good to go. 7. Spoon 1/8 cup potato mixture per latke into the oil. Flatten with a spatula. Don’t crowd the pan! 8. Reduce heat to moderate and cook until golden brown, about 1 ½ or 2 minutes per side. 9. Transfer latkes to a cookie rack to drain (paper towels also work, but can make latkes soggy). 10. Turn on your oven’s broiler. 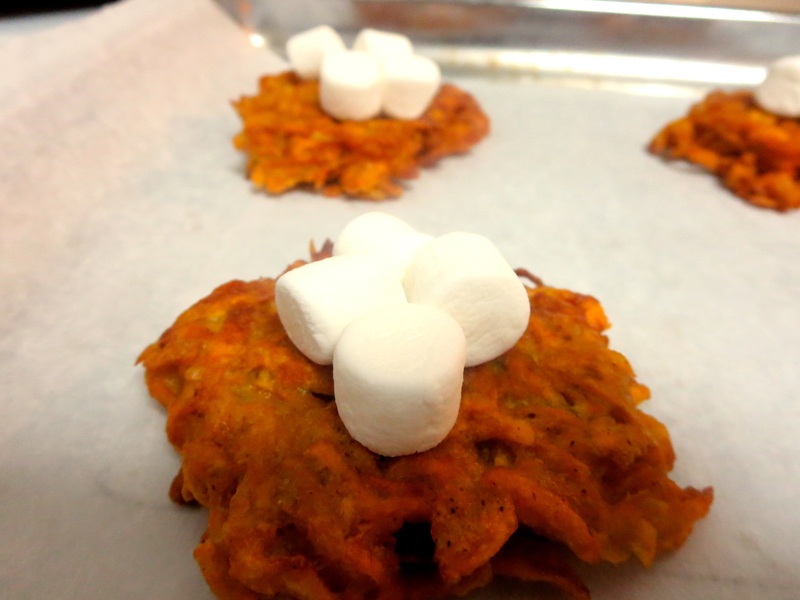 Place latkes on a baking sheet lined with parchment paper and top each latke with marshmallows. 11. Put latkes and marshmallows in the oven and watch carefully to make sure the marshmallows don’t brown too much. 12. Once marshmallows are nicely toasted, plate your latkes and enjoy! What Thanksgivukkah mashup dishes are you making this year? This entry was posted in Holidays and tagged recipes.